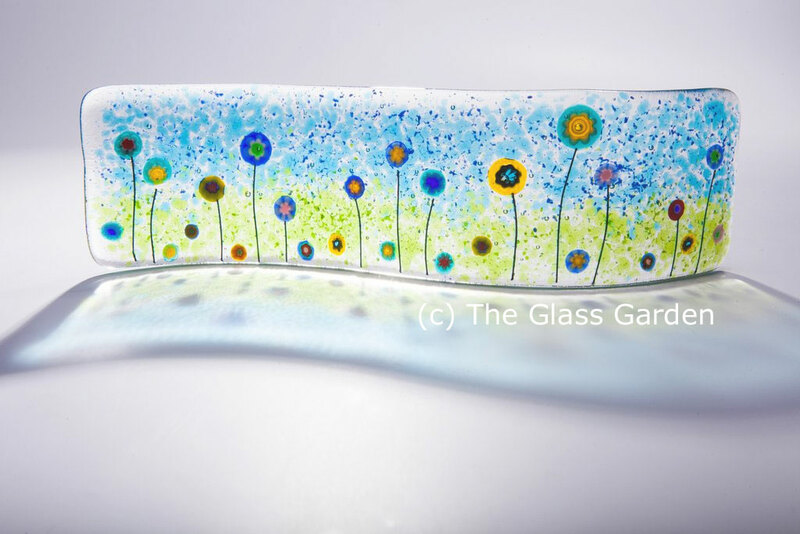 Caroline Mouran, a British self-employed fused glass artist of The Glass Garden in Heathfield, East Sussex, created this delightful art glass piece entitled: Millefiore Flower Fused Glass Wave. I love the lightness of it and the way that light plays with it. I also appreciate the interesting combination of colors she used to create the soft delicate background with the bold bright colors of the flowers. This piece feels like it would lighten and brighten any place you displayed it. ‘Millefiore’ means a million flowers in Italian, and with bright bursts of colour….this hand-made fused glass art wave is as happy and fun as an Italian summer! I have created this glass art wave by fusing slices of millefiore flowers on to some green green grass, and bright blue skies, with thin copper wire for the stalks. View more of delightful pieces, including jewelry, coasters, dishes, and light catchers, via her online shop/gallery. Caroline’s wave of flowers piece shows us how joy can be expressed with just a simple curved line and dots of delightful colors; reminding us to find joy, to en-joy, the simple things in life. If you would want your mandala or your idea for a mandala to be considered for the “Mandala of the Day”, read about how on the Participate page. It’s easy! Or recommend one you’ve seen via my Contact page.